With the new MightyMeals partnership, MightyMeals customers can now mix and match six-packs of South Block juices or buy one- to three-day juices cleanses, which South Block calls "a mini-vacation for your body in a bottle." Burke, Virginia-based healthy meals delivery company MightyMeals now includes juices and snacks from Arlington-based South Block on its delivery menu. Both companies have close ties to the Washington-area fitness community. 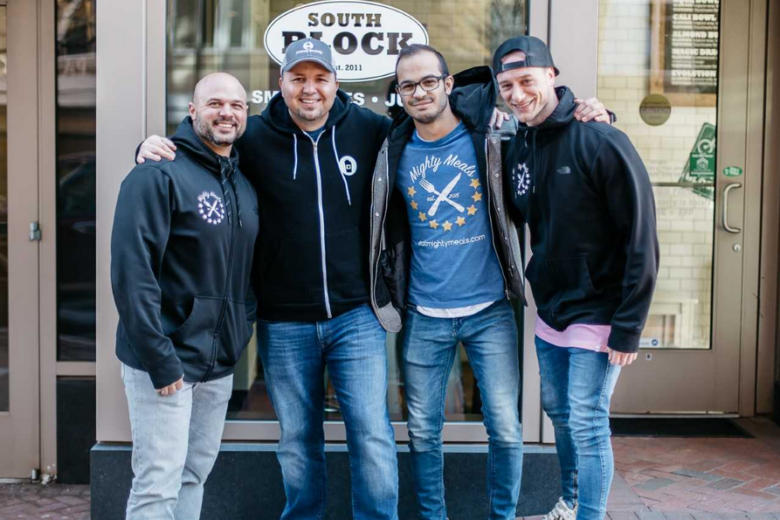 MightyMeals — founded by fitness professionals Dan Graziano and Alex Lebonitte, along with executive chef Stefano Marzano — launched in Fairfax County in 2015 and delivered about 150 meals in its first week. At the time, the menu only had six items. Today, it handles thousands of meals a week with a menu of more than 40 chef-prepared meals. In addition to pre-scheduled deliveries, MightyMeals has more than 50 pickup locations at gyms and fitness clubs around the D.C. area. Its deal with South Block does not include juices at pickup locations. South Block owner Amir Mostafavi opened the first South Block Cafe in 2011. There are now eight locations in the D.C. area serving cold-pressed juices, smoothies and acai bowls, with two more opening soon in Arlington’s Ballston and Rosslyn communities. South Block makes its cold-press juices daily in Arlington.